Diamond Scale is an iPhone app developed byLeviteo. Believe it or not, this accurate little app turns your iPhone into a scale for weighing small items, including jewelry. The iPhone can be used for a staggering array of tasks. You can download apps that transform your phone into a stud finder, measuring device, plumb bob, or level. Now, it’s also a tool for weighing diamonds, coin, and precious metals. Here’s how it works: you place your phone on top of an inflatable bag (you can go low tech here…a snack sized bag of potato chips can work, or even an empty Ziplock bag.) Next, you place a coin on the surface of your iPhone’s screen (ideally right in the middle of the bottom third of the screen.) 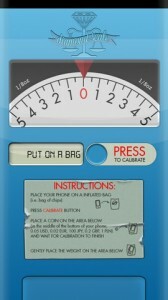 Just tap the calibrate button, and then you’re good to go! The type of coin your use for calibration does matter. In the US, you need a nickel. In the UK, you need a two penny coin. In Japan, a 100 Yen coin works. Using the Euro? A two cent coin works. This app has zero adds, which makes for a cleaner app experience. Results are displayed in grams and ounces. You should be aware that Diamond Scale is extremely fussy. You’ll need a delicate touch to make it work properly, but this app is still way cheaper than buying a dedicated jewelry scale. You’ll need to gently place items on the screen, and avoid touching the inflated bag during measurement in order to get accurate measurements. If you want to weigh a small amount of silver coinage or determine the carat size of your jewelry, Diamond Scale is a helpful tool. Who knew the iPhone had so many unique and creative uses! 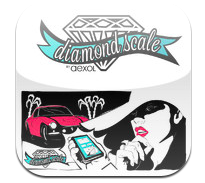 Diamond Scaleis compatible with iPhone, iPod touch, and iPad. Requires iOS 4.3 or later. This app is optimized for iPhone 5.